I was looking for cheap double walled cups for my new Tassimo machine. Sometimes it takes a long time for me to finish the drink so I thought that thermal cups could keep my coffee hot that bit longer. The cheapest I could find in the size of 330ml and more were around £15 for a pair and with rather mixed reviews. These Bodum glasses are only a little more, but you get the quality of Bodum. It is a lot of money for 2 cups, but then they are everywhere else for around £30 mark. I think Amazon is price matching House of Fraser sale price. I'll stick with the sub £1 thanks. The deal is hot for someone that wants bodum double walled glasses. Ikea glasses are nit double walled. Right? Yes. Two. I would love to pay £10 for double walled glasses with 330 ml capacity, but could not find any. Not even unbranded. Why do they have to be double walled? It is a large cup of coffee. It keeps the temperature of the drink (hot or cold) for longer. Hmmm... I bought some latte glasses for my Tassimo machine and they are single walled and drinks stay hot just fine. I also have original Tassimo latte glasses which are also single walled but never use them because they don't have handle. I think people mostly buy these double walled ones because they look fancy. 0.4l? Really? Should I cancel the order? I thought Costa latte is about 330ml? Yes. Two. I would love to pay £10 for double walled glasses with 330 ml … Yes. Two. I would love to pay £10 for double walled glasses with 330 ml capacity, but could not find any. Not even unbranded. I know its over the £10 mark, but Currys have a set of 4 bodum double wall glasses for £20. Two 350ml, two 80ml. Search for 'Pavina' at Currys website. They're nit.I'll stick with the sub £1 glasses thanks. Respect peoples opinions. Your comment showed your character well. 0.4l? Really? Should I cancel the order? I thought Costa latte is about … 0.4l? Really? Should I cancel the order? I thought Costa latte is about 330ml? From my experience with the "regular" sized latte glasses like these it will overflow with the drinks which require two pods (like the Costa lattes) creamer and espresso, but will be fine for single disc/pod drinks such as crema etc..
From my experience with the "regular" sized latte glasses like these it … From my experience with the "regular" sized latte glasses like these it will overflow with the drinks which require two pods (like the Costa lattes) creamer and espresso, but will be fine for single disc/pod drinks such as crema etc.. It is a large cup of coffee. It keeps the temperature of the drink (hot … It is a large cup of coffee. It keeps the temperature of the drink (hot or cold) for longer. what if it is warm ? £279 for a ps4 isn't a cheap deal when you can get a PS3 for £150, but they are NOT THE SAME THING. Fair enough pointing out cheap latte glasses as alternative, but no point voting cold just because you can get cheaper at ikea. I've got myself 2 idea glasses, but they are tiny... 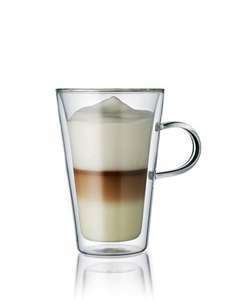 Apparently original Costa latte glasses are 15oz and Ikea look like 11oz max.